We are now approaching the time of year when we carry out the CPD audit. Those who have been selected for audit have now been informed and I would therefore urge everyone to fully engage with the process and get in touch if there are any issues. The RCT has some very useful information on our website here. Please spend some time reading the information as it is there to help you. There are some anonymised submissions from previous CPD audits for information: however, we hope that you are recording your CPD as it has been happening throughout the year. All submissions must be via the mycareerpath website, as previously mentioned (and see below). For those preparing for audit, there will be a special webinar to help you on Monday 18th March at 13.30 – to register click here. At the end of January this year, 132 registrants were lapsed for non-payment of their renewal fees. This is around 5 percent of registrants. In the weeks that followed, IPEM staff took around 30 calls from registrants who had not intended to lapse their registration. Some of these registrants had received all of our email communications but kept getting waylaid by their day-to-day lives and their payment was not made by the deadline. Other registrants advised they did not receive our emails, despite IPEM not receiving bounce-back messages from their accounts. The result for these registrants was the same. There is no process allowed under RCT policy and procedure to reinstate registrants for non-payment unless they have been away from work due to illness since prior to renewal notifications being sent out until after the deadline. This must be confirmed by a line manager or a head of department. Unfortunately for these 132 registrants, the only way back on to the Register is to reapply and for some, that means completing an equivalence application with a portfolio because they were grandfathered onto the Register many years ago. As a result of this, the RCT Management Board has made the decision to introduce mandatory payment by direct debit for renewal fees for all registrants in the UK. This will become the only way to pay from December 2020 for renewals due on 1 January 2021. However, we would urge you to complete and return a direct debit mandate now in preparation for renewals due on 1 January 2020. You may think that forgetting to pay your renewal fees would never happen to you and you may think that your workplace IT server will allow all emails from us through to you, however, it is clear from the number of calls received that this can happen to anyone and the RCT Management Board wish to do everything they can to ensure that registrants aren’t lapsed due to non-payment and then have to go through the time and effort of a re-application, not to mention the cost that incurs. We sincerely hope you will take up the offer to get your direct debit in place well in advance of the next renewal cycle. You can pay in 1 annual payment in January or have the amount due split into 12 monthly payments. Please use this link to access the direct debit application form – no payments will be taken until January 2020. Online Register – are your details correct? There are times when your work location may change. It is important to remember that it is your responsibility, as a registrant, to keep your details up to date on the register. Check the online register to ensure your details are correct and if something has changed, send us an email with your new details, so that we can update the register. The Policy on Removal from and Restoration to the RCT has been updated by the RCT Management Board with the introduction of a new registration status category of ‘Inactive’. Any registrant who was previously marked as De-Registered, but left the register in good standing, is now marked as Inactive. Only those who have left the register for negative reasons – i.e. due to non-payment of the renewal fee, removed for failing the CPD audit or for conduct issues, will now be marked as De-Registered. We are delighted to inform members that we have chosen the mycareerpath® online professional development system, designed and managed by the Engineering Council, to plan, evidence and record professional development. The tool, which is compatible with smart phones, tablets, PCs and Macs, is accessed by logging on to the IPEM website, navigating to My IPEM and selecting the mycareerpath® tab from the left-hand menu. The first time you access mycareerpath® from the IPEM website you will be asked to create an account which is primarily for the purpose of agreeing to GDPR. This only happens once and all subsequent times you click on mycareerpath® you will go straight into the system. When you logout of mycareerpath® you will be directed back to the IPEM website. mycareerpath® can be used to plan, evidence and record CPD and can also be used to plan, evidence and record progress towards defined competency standards such as the requirements needed to meet the professional registrations of the Engineering Council (EngTech, IEng and CEng) and the Science Council (CSci, RSci and RSciTech) (If you are intending to apply for one of these registrations you need to be a member of a qualifying professional body, i.e. IPEM). CPD is the default profile and you begin to record your CPD by uploading information to the ‘Evidence’ tab. You can also use the ‘Plan’ tab to set out your CPD aspirations at the beginning of a year. mycareerpath® enables you to self-assess your progress against the individual competencies within a chosen profile. mycareerpath® enables you create an action plan. You can add evidence, including any supporting documentation like certificates, videos and testimonies, to demonstrate that you have developed or increased competence. You can add web links or upload supporting documents. These will remain attached as evidence and reviewers will be able to examine them. You can generate reports for each profile over a specified period of time. A CPD report assembles a chronological list of all plans and evidence started during the period specified. The competence report assembles a list of plans and evidence from the profile selected that started during the period specified. Plans, evidence, reports and competence profiles can all be sent for review to any email address. This allows you to demonstrate progress to colleagues, employers, mentors etc. Reviewers will receive an email inviting him/her to view the page in question and add comments. Once a comment is added, the link expires. Plans, evidence and reports in mycareerpath® can be exported and saved in PDF format. mycareerpath® is being used for the IPEM and RCT annual audit in 2019. If you have been selected for audit for this round (you will already have been informed of this), we ask you to upload your CPD summary to mycareerpath®. Paper submissions are no longer accepted via email or post. You will be able to use mycareerpath® to record your CPD activity in 2019 and seamlessly upload these records if you are selected for audit in 2020. For further details on mycareerpath, please visit the IPEM website. 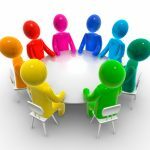 The role of the Registrant representatives is to represent the views of Registrants on the RCT Management Board and contribute to the management of the Register. Lay members are appointed to provide a wider perspective on healthcare and public protection and are not part of the technologist profession. We are delighted to welcome our new Registrant representative – Carolina Rodrigues and our new Lay member – Sue Bentley. Read their biographies here. The CPD audit has now been finalised and a report will be added to the website and sent out to all Registrants in due course. 83% of Registrants passed the audit this year. Check the CPD page for further details. Due to increasing standards of CPD submissions the RCT is investigating the possibility of introducing a CPD award for outstanding submissions. We currently have vacancies for RCT Assessors. If you are registered on the RCT are looking for a new challenge, this is an interesting and varied role to add to your CV and could also count towards your CPD. If you are also an IPEM member and would like to submit an application, please visit the ‘Get Involved’ page on the IPEM website when you are logged into your account, where you will find the role description and generic application form; or see the here for further details. There are times when your work location may change. It is important that you keep your details up to date. Check the online register to ensure your details are correct and if something has changed, send us an email with your new details, so that we can update our records. Following the announcement that Physician’s Assistants are to be statutorily registered, the RCT has contacted the HCPC again to see if there is a new opportunity to apply for statutory regulation for clinical technologists. The RCT Registrar, Iain Threlkeld, has pledged to submit his own CPD portfolio for assessment in 2019, as an example to other Registrants that it is not an impossible task! 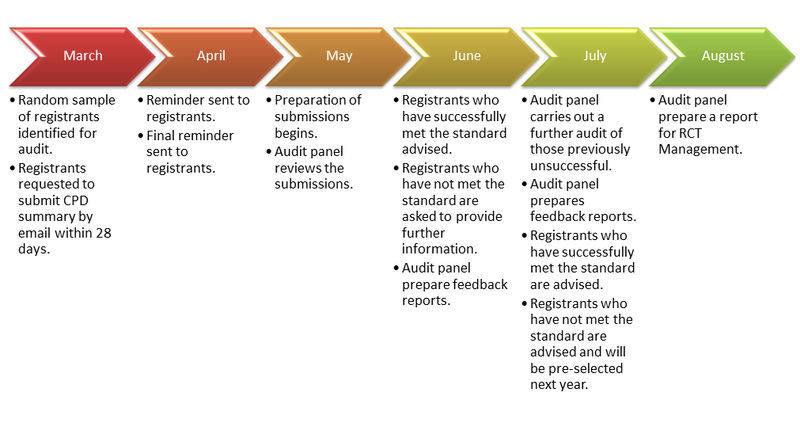 The plan is that Iain’s submission will be audited ahead of the usual cycle, so that it can be used as an example for other RCT registrants, to give them confidence in completing their own forms if they are selected for audit. The Professional Standards Authority noted this as an example of good practice for other Accredited Registers to follow, when re-accrediting the RCT this year. The RCT Professional Conduct Committee (PCC) wants to help all Registrants to work within the Code of Professional Conduct of the RCT, in order to protect the safety of patients and the public. So we identify the learning points from all Fitness to Practise cases that come before PCC Panels and make these available through the RCT website and the Registrar’s Update. For learning from the latest case, please click here. On the website you can also read the outcomes of cases, and find out about hearings coming up. The RCT Panel consists of two Registrant representatives. The role of these individuals is to represent the views of Registrants on the RCT Management Panel and contribute to the management of the Register. This entails attending three RCT Panel meetings in York each year; these being in February, June and October. Two vacancies have arisen for Registrant representatives and applications for these positions are now invited from RCT Registrants. If you are an IPEM member would like to submit an application, please visit the ‘Get Involved’ page on the IPEM website when you are logged into your account, where you will find the role description and generic application form, or visit the RCT website. There are still a small number of Registrants with no work location held on the RCT website. These Registrants were contacted recently and asked to provide this information. If you have been contacted and have not yet responded, please email this information to us on enquiries@therct.org.uk as soon as possible. 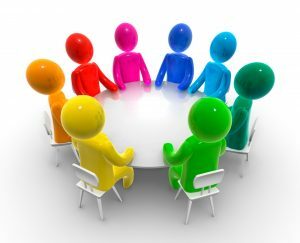 We currently have a vacancy for a lay member to sit on the RCT panel. Lay members are appointed to provide a wider perspective on healthcare and public protection and are not part of the technologist profession. The lay members attend Panel meetings and contribute to all aspects of the Panel’s work. The positions are unremunerated but travel expenses will be paid in line with IPEM’s policy. If you know somebody who has an interest in healthcare and the role of healthcare professionals; are committed to improving the quality of public services; and are keen to work alongside professionals to develop the technologist profession this voluntary role may be for them. Please direct them to the vacancy on the RCT website. The CPD audit is being finalised with 34 registrants being re-audited. Once this process has been completed, the results will be published on the RCT website and a report will be emailed to all Registrants. Please remember to keep a record of your activities on the RCT Detailed Record of CPD Activity form which is available from the RCT website. This will make it easier for you to collate your information if you are selected for audit next year. The RCT Management Panel is to be renamed the RCT Board to better reflect the level of responsibility the members of the Panel undertake. It is also a way to distinguish the RCT as having its own board rather than being a Panel of IPEM. The Panel agreed to the name change which would take effect in September at the beginning of the next corporate year. We are once again approaching the time of year when we carry out the CPD audit. The office will soon be sending out the emails to everyone selected for audit, so I thought it may be worth sharing some information in advance. We have seen several registrants removed from the register recently for failing the audit, with some failing to even submit any evidence of CPD. I would therefore urge everyone to fully engage with the process to ensure this does not happen to you. The RCT has some very useful information on our website here. I would recommend everyone to spend some time reading the information which has been put together to help you all pass the audit if selected. We even have some anonymised submissions from previous CPD audits to help guide you, although I would hope you have already been recording your CPD as it has been happening throughout the year. Can you also ensure the office has your correct contact details, if anything has changed recently with your email address then you will need to contact us? We don’t want anyone to fail to respond to a request to submit evidence of CPD due to not having kept their details up to date. We have received a lot of positive feedback from Registrants following the recent Finance Update which was forwarded to registrants in December 2017. Thank you to all those who have taken the time to read it and provide feedback. If you would like to view the report again, it can be downloaded here. There are nearly 80,000 healthcare professionals on accredited registers in the UK, representing a huge workforce with potential to make a significant contributionto promoting and protecting the public’s health. In order to better understand their role in this regard, the Royal Society for Public Health (RSPH) and the Professional Standards Authority (the Authority) have undertaken a joint project to uncover the ways that accredited registers (AR) occupations are already supporting the public’s health, and explore the factors that may be hampering their further utilisation. You may have heard about this project and its aims. One of the key recommendations is for registers to consider introducing a health assessment tool which could be used by practitioners with all their new clients. It was felt that such a tool, if used well, could help provide practitioners with the rationale and opportunity for healthy conversations with their patients. The RCT complies with the Data Protection Act 1998, and is preparing to comply with the General Data Protection Regulations (GDPR) which will come into force from May 2018. The information that we publish about you in the online register is your name, registration number, approximate geographical area of practice and the date your registration started. It is important that you keep the RCT informed of any changes to your personal details so that we are able to keep touch with you; particularly as renewal and audit communications are circulated via email. We still have a small number of registrants with no Scope of Practice listed. Please check the online register and if you have no Scope listed alongside your details, please inform us of this as soon as possible. Further details on the Scopes can be found via the following link. The simple answer to this is that the RCT is a register, not a professional body so there are no member benefits such as those which come with IPEM, IHEEM or ART membership. For some professions, being on a statutory register such as the General Medical Council or the Nursing and Midwifery Council are a legal requirement in order to be able to work. The RCT is of course voluntary, but by being on the register it demonstrates that you are committed to maintaining professional standards and protecting the public. Also many employers do ask that their staff are on the RCT as one of their conditions of employment. I am of course aware that this only goes part way to answering the question “What do I get from the RCT for my registration fee?” So I thought we should show all registrants some transparency and explain how your £21 will be spent in 2018. It is worth noting that IPEM supported the RCT financially for many years, however it is an important part of the Professional Standards Authority (PSA) accreditation that the Register demonstrates that it can be self-sustaining, so we can no longer reply on IPEM to do this. This diagram demonstrates how the £21 is divided between the financial commitments of the register. The largest part of the fee is of course the £13.52 each registrant contributes to the running of the register. This includes such costs as office overheads and the website and online register. However the largest percentage of this is for staff time, which is provided by IPEM but funded by the RCT. It was not until I became involved with the RCT management panel that I saw how much time and effort the hard working IPEM staff contribute to us. There are roles which are essential such as writing and updating our policies and procedures and also getting us through the annual PSA accreditation. They also have hours and hours of work each year processing renewals and the CPD audit. 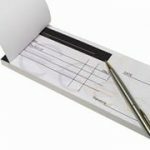 If registrants were more proactive in returning the CPD reports or were to switch to direct debit payments, this would certainly make the register more efficient. Moving round the chart, the next segment is the £0.88 spent on management panel costs. The management panel consists of 12 people who meet 3 times per year at the IPEM national office in York to manage the Register. These costs are to cover members’ travelling expenses but the room is provided free by IPEM. In addition, a small amount is set aside in case management panel members need to travel to attend other meetings such as the annual conference held by the Professional Standards Authority who accredit the Register. RCT disciplinary panel costs are £0.69 per registrant. All members of the Professional Conduct Committee of the RCT undergo annual training for their role which is held at the IPEM national office; again a room, and the training itself, is provided free by IPEM. In addition, a small amount is set aside in case disciplinary panel members need to travel to attend hearings. PSA Fees are the second largest spend at £4.05. This is the cost of annual accreditation by the Professional Standards Authority. Audit costs – the annual CPD audit involves assessors attending the IPEM national office to assess the CPD summary forms of registrants selected for audit. The costs relate to those assessors travelling to the CPD audit day held for 2 days in May at the IPEM national office in York; a room is provided free by IPEM. The cost of the annual CPD audit is £0.49 each however a lot of the background work prior to this is carried out by the IPEM office staff and is captured in the running the register percentage. Application assessments costs at £0.66 include the training of all RCT application assessors for their role. This takes place annually at the IPEM office where again the room is provided free of charge. Finally promotion and publicity cost each registrant £0.71 a year. This covers the print and design of brochures, leaflets and posters to promote the Register and to educate the public about the RCT’s accredited register as well as about the work done by Clinical Technologists. In addition, the cost of the certificates sent to new registrants once they have been successful in their application to the Register. 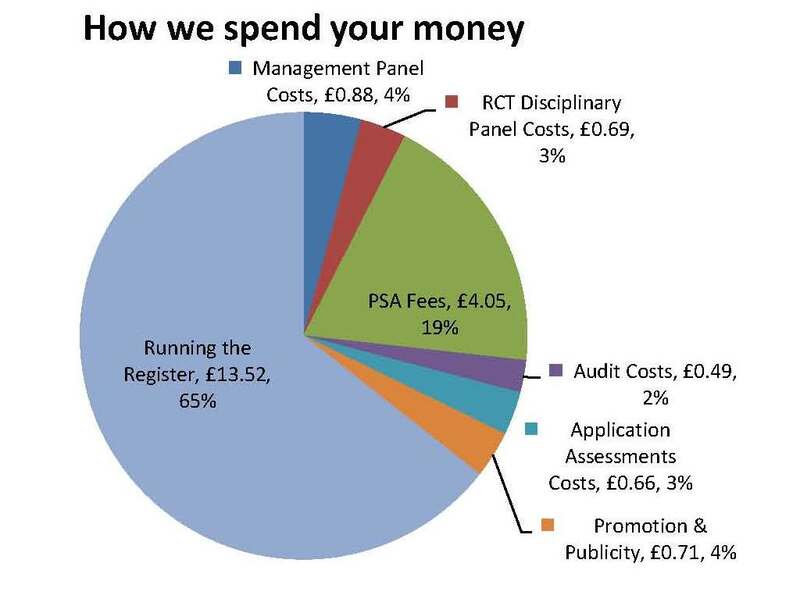 I hope this explains how your annual fees are spent and when these are compared to other voluntary registers it shows the RCT is run very effectively and manages to keep its fees as low as possible. 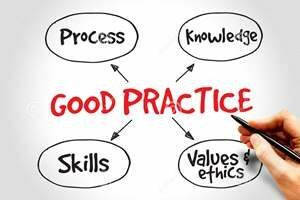 The Scope of Practice for Registrants has now been added to the online Register. We now ask all Registrants to check your entry and inform the RCT Administrator if you see any errors or omissions. If you have moved location and notice this needs updating, please inform us of this as soon as possible. 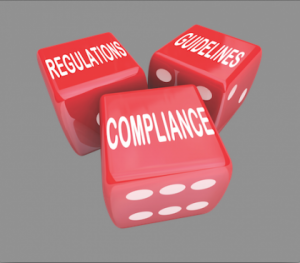 It is a Registrant’s responsibility to keep the RCT up to date of their details at all times. We are delighted to confirm that the PSA has approved our re-accreditation application for the coming year. There were no concerns raised by the accreditation team and we look forward to the year ahead. The new professional conduct committee (PCC) are now fully trained and ready to act on behalf of the RCT should any issues which require their input are raised. The management panel would like to thank our new volunteers for taking up this challenging role. There is to be a separate financial overview, giving a detailed breakdown on RCT expenditure. This is currently being put together and will be sent to all Registrants when finalised. This should answer any questions you may have about how your fees are spent. PSA fees are currently under review. The RCT has responded to the PSA regarding their proposal for a review of accreditation fees and we are confident that any changes will have minimal impact of the current cost of registration. In 2018 we are introducing the option for RCT registrants to pay their renewal fee by monthly direct debit. If you do not pay by direct debit at present, or if you already pay by annual direct debit, you will have the option to pay by monthly payments. Email communications have been circulated regarding this, but if you missed this, and would like to pay by monthly direct debit, please request a form. If you would rather pay by annual direct debit, download a form. The RCT CPD audit took place on 16 May and 63 registrants (2.5% of the register) were selected for audit. Of the 63 audited, 16 did not submit any CPD. Of the 47 who did submit, 27 passed and 20 did not pass. These 20 were required to re-submit and of these 7 did not do so. Thank you to all those who submitted their CPD for audit. A full report will be circulated in due course. It has been confirmed that Andy Mosson will remain as assistant registrar for a full term of three years from his start date of 1 September 2016 which was initially to be a temporary one year term for consistency and transition purposes. The panel welcomed this decision. ‘Accredited registers meet our demanding standards including protecting the public, governance, education and training, risk management and complaints handling. 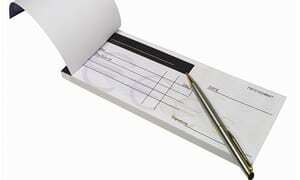 Accredited registers provide a safety net. A practitioner who is struck off one accredited register (or by a regulator) may not simply join another accredited register’ Read their full statement here. It is now time to apply for re-accreditation with the PSA. This is an annual process and the deadline for our application is Friday 28th July. Progress can be followed on the PSA website here. A new return from career break notification form has been introduced for all registrants who have returned to work after a career break. This must be submitted to the RCT when you return to work under your original Scope of Practice. If you return to work under a different Scope of Practice, then you will be required to complete the Career Change Notification form. Please see the Career Break policy on the RCT website for full details. 230 Tadcaster Road, York, YO24 1ES. Summary minutes from the June 2017 meeting can now be found on the RCT website. In 2018 we are introducing the option for RCT registrants to pay their renewal fee by monthly direct debit. If you do not pay by direct debit at present, or if you already pay by annual direct debit, you will have the option to pay by monthly payments. Email communications will shortly be circulated regarding this, so please keep a look out for the instructions. 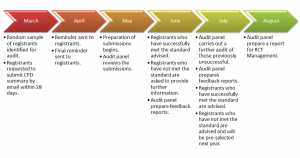 A reminder that the CPD Audit process begins in March when a random selection of registrants will be identified for this year’s audit. Those who have been selected for audit will be requested to submit their CPD Summary by email within 28 days. To make the process easier, there are forms and guidance notes on the RCT website to help you to do this. Remember that it is a condition of your registration that you maintain adequate CPD and submit records when requested. This ensures that you remain up to date with current developments and good practice within your profession. You should maintain your CPD records throughout the year, which will be a benefit if you are selected for audit, as it will make the process easier for you. If you would like any advice on the audit, please contact enquiries@therct.org.uk. Our leaflet – Information for patients and the public – has recently been updated. The leaflet provides vital information to patients and increases public awareness of the register. We have also produced a poster and departmental certificate to display alongside them. We would encourage you to request copies for display in your department by emailing enquiries@therct.org.uk. In the coming months we will be introducing a column on the RCT online register to show the Scope of Practice each Registrant is registered under. In order to do this, we will be contacting each Registrant to ask you to confirm which Scope of Practice you are registered under. Please look out for our communication and respond as soon as you can, to enable us to update this functionality effectively. We encourage applications from those who have trained and worked overseas and are now working in the UK, and the launch of the Equivalence Routes directly supports such applicants. Equivalence is intended as a route to registration for anyone who is working within one of the RCT scopes of practice and does not have access to either of the primary routes to registration. Anyone who has a relevant qualification and can demonstrate they meet the equivalence criteria can apply to join the RCT via this route. You should be aware that you must inform the RCT management panel when you intend to take a career break. A career break involves a registrant taking an extended period of unpaid time away from their work and returning to work in the same Scope of Practice. You must also tell us if you are intending to make a career change. A career change involves a registrant taking time away from their current Scope of Practice to undertake further training and development (which may be paid or unpaid), before returning to work in a different Scope of Practice. To notify us of your intention to take a career break or undertake a career change, please read the policy on the RCT website before completing the notification form, at least 1 month before the proposed start date of the career break or career change and sending it to us. After the annual renewal process this year, some registrants were removed from the register for non-payment. This may be because of forgetfulness; however setting up a direct debit would avoid this! You can set up a direct debit at any time – the application form is available from the RCT website. Just complete and email or post this back to us. The equivalence route for registration is an area which is expanding and we are looking to add to our team of assessors to cover future needs. If you believe that you have the skills to assess technical portfolios we would love to hear from you. We are planning a training day for new and existing assessors soon, so if you would like to get involved this is the perfect time. Please email us a copy of your CV and we will be in touch soon. Summary minutes from the February 2017 meeting can now be found on the RCT website. 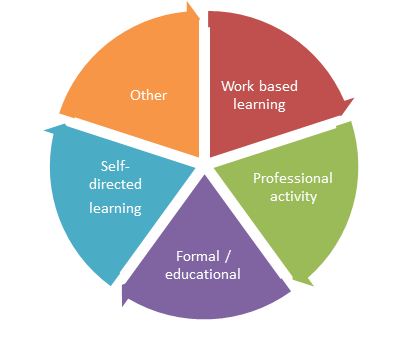 The RCT policy on Continued Professional Development has recently been updated and is available to download from the RCT website. Please ensure that you read the policy as it applies to all CPD activity from 2016 onwards. In particular there are penalties for not producing CPD evidence when requested to do so at audit – with removal from the Register being the most severe. We want to help you to be successful with your CPD audit, so please do submit your portfolio when asked: this gives you time to get help and support for a re-submission if necessary, and avoids the most severe penalties. The annual renewal fee for 2017 will be £18.00, an increase of only 50p. The increase has been kept to a minimum, but is necessary to cover costs incurred by implementing the CPD audit, renewing PSA accreditation and increasing general costs. Application fees have not been increased. Please remember that you can set up a direct debit to take the worry out of having to remember to pay your fees! Being on the PSA-accredited Register of Clinical Technologists is a personal achievement and an indication of professional standing, which deserves recognition by employers and patients. With the permission of the PSA, the management panel has agreed that Registrants can now use the post nominal letters ‘RCT’ to signify that they are on the Register. All Registrants can now use ‘RCT’ after their name for the duration of their registration. Should your registration lapse through non-payment, or if you are removed from the Register for disciplinary reasons, then you must cease using the post-nominal letters immediately. We are extremely pleased to report that we were successful in gaining PSA re-accreditation for another year. We were deemed to have met the PSA’s standards for re-accreditation for a second year. The Register was praised by the PSA for the work undertaken in its first year as an Accredited Register. The whole process begins again next March for re-accreditation in September 2017. We have recently welcomed two new members to the RCT management panel. 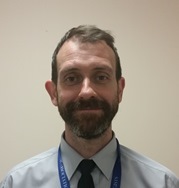 Ian Wilde is the Technical Service Manager at the Manchester Royal Infirmary dialysis unit and he joins us as a representative of the Association of Renal Technologists. 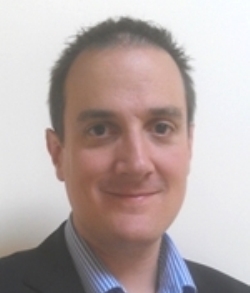 Shaun Lundy is Clinical Engineering Team Leader at County Durham and Darlington NHS Foundation Trust. 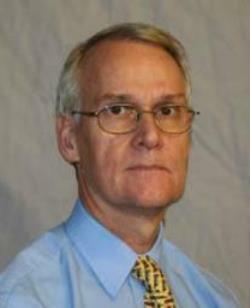 He is a Member of IHEEM, registered with the RCT and also with the Engineering Council as an Engineering Technician. 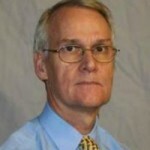 He is the panel’s second IHEEM representative. We would like to extend a warm welcome to both and look forward to their valuable input into the RCT panel. This conference is held every year and this year it’s in Manchester from 12 – 14 September. There is a technologist skills session from 14.45 – 15.45 on Monday 12 September. The session is called ‘Registration – the best way to recognise technologists’ skills?’ and Elaine Buckley, Chair of the HCPC, Registrar of the RCT, Andy Mosson, plus a representative from the PSA will be attending to talk about registration. We expect this to be an extremely interesting session for all technologists, whether they are registered on the RCT or not, as they will all have a view about whether technologists should be registered at all, and if so, whether with this should be with the HCPC. The session is a chance for them to hear from, and debate with, the key people from the RCT, the HCPC and the PSA, all in one room. You can find full details of the programme here: http://www.ipem.ac.uk/ConferencesEvents/MPEC.aspx. If you are attending the conference, be sure to attend this session! (Sorry, places on this free members’ day are fully booked!). 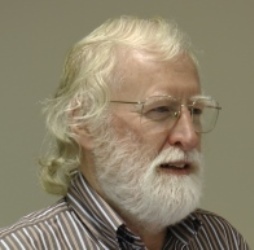 One of the longest serving members of the Management Panel and the current Assistant Registrar, Andy Iles has recently stepped down from his post after his retirement. We would like to sincerely thank him for all of his hard work and dedication to the role over the many years he has worked with us. 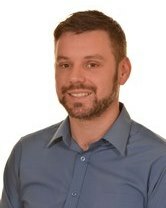 Taking over the role of Assistant Registrar is Iain Threlkeld, who has been an IHEEM representative member on the Management Panel and one of the main contributors to the development of the Equivalence Routes. 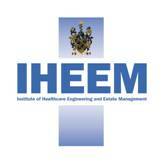 We will be seeking a new IHEEM rep to replace Iain. The RCT’s Professional Standards Authority accreditation is due for renewal and the application has recently been submitted. The re-accreditation process should be complete in September. We will inform you of the outcome of the assessment as soon as possible. In other news, the PSA has welcomed a new Chair, George Jenkins OBE, who replaces Baroness Jill Pitkeathley, who has recently stepped down after eight years in post. Former Junior Health Minister Ben Gummer MP said in December 2015: ‘The Government remains committed to reform of the regulation of health and (in England) social care professionals. The Government is grateful for the work of the Law Commissions of England and Wales, Scotland and Northern Ireland in making recommendations and has been considering how best to take these forward. Our priorities for reform in this area are better regulation, autonomy and cost-effectiveness while maintaining and improving our focus on public protection. We intend to consult on how these priorities can be taken forward, taking account of the Law Commissions’ work on simplification and consistency and building on the Professional Standards Authority for Health and Social Care’s paper Rethinking regulation published in August 2015. We will present proposals that give the regulators the flexibility they need to respond to new challenges in the future without the need for further primary legislation. 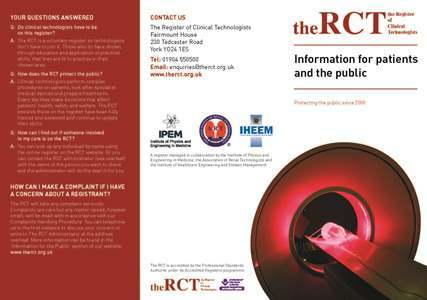 A new RCT leaflet has now been launched which aims to inform patients and increase the public awareness of the Register. Promoting the valuable work of registrants and the standards which you have met is vital for public protection. We would encourage you to request copies for display in your department by emailing enquiries@therct.org.uk. In addition to the leaflets we have had a poster and Departmental certificate designed to display alongside them. These can also be requested by email at the above address. Thank you to those of you who took part in the ballot to elect two new registrant representatives to the RCT’s management panel this year. It was pleasing to note that 30% of registrants voted in the ballot (previously this had been 16%). The management panel makes all the important decisions about the running of the register so it is important that you have your say in who represents you on it. Elizabeth Crawford is a specialist technologist within the radiological physics department of Leeds Teaching Hospitals NHS Trust and is keen to see entry routes into all technologist professions clarified so that new starters can identify a clear career path and, ultimately, work towards registration as a respected and recognised member of the healthcare science community. 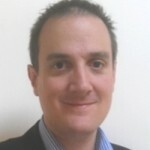 David Donohue is a chief clinical technologist at South Tyneside Hospital. The clinical technologist profession is important to David and he believes a strong professional organisation and regulation is important for growth, development and security. We were also delighted to welcome Rosemary Anderton and Phil Goddard, our two lay representatives, to their first meeting of the management panel in February. The former disciplinary procedure has been updated and renamed the Fitness to Practise procedure to take account of issues which may be reported to the RCT involving either a registrant’s health (which is not a disciplinary issue) or his/her conduct (which may be). The other main changes that have taken place involve the decision to make hearings routinely open to the public (which is usual practice for statutory registers); changes to the composition of the appeals panel; and clarification of the process for handling potential complaints that come to light via news or social media sources rather than by individual complaints. The revised Fitness to Practise procedure which was approved by the RCT management panel at its February meeting can be found on the RCT website. The physics standards for the equivalence route have now been finalised and a pilot is underway. Once the pilot has been completed, the route will be formally launched and the relevant information will be added to the RCT website. If you think that you may be eligible to apply via the physics equivalence route and would like us to contact you once the route is launched please email enquiries@therct.org.uk with your name, email address, telephone number, work location and the Scope of Practice you are working under. 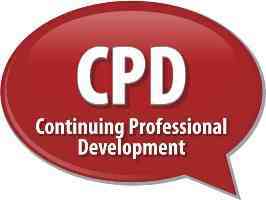 All registrants are required to keep up to date with their CPD and be able to demonstrate that they are doing so. Further information has been added to the RCT website to help you to maintain your CPD record. This information includes potential CPD activities together with example submissions from a rehabilitation engineer, radiotherapy technologist and a nuclear medicine technologist to help you prepare your own portfolio. This year’s CPD audit takes place in May and we will be contacting a random sample of registrants in March to ask for a summary of their CPD record. The equivalence route for registration is an area where we are expecting growth and we are looking to expand the team of assessors to cover future needs. If you believe that you have the skills to assess technical portfolios we would like to hear from you. We are planning a training day for new and existing assessors in Q2 of 2016. Would you like to get involved in the Register of Clinical Technologists and do you have an interest in continuing professional development? We are looking to expand the assessor pool this year and it is a great opportunity to expand your own professional development. Please do get in touch if this is something that you feel would be beneficial. It is likely that training will take place on 17 or 18 May 2016 with the opportunity to include assessment. – Deregistered – this means that the registrant has been expelled from the register. Where there has been a Fitness to Practise (previously called ‘disciplinary’) hearing involving a registrant a summary of the case will appear on the website in line with best practice of other voluntary and statutory registers and there will be a link from the register page to this page. This is so that the public can be assured that the individual has been appropriately investigated in order to protect patient safety and can see why they have been cautioned or deregistered. The summary minutes of the RCT MP held on 10 February 2016 are available via the RCT website. This enables registrants to keep up with the discussions and decisions being made on their behalf. The career break policy has been developed to enable registrants to take an extended period of unpaid time away from work in order to balance their career with other commitments, responsibilities and interest. Registrants who are planning to take a career break are required to notify the registrar and will be removed upon commencement of their break. If you are taking a career break, please complete the relevant form which is available on the RCT website and forward this to the registrar at least one month prior to the commencement of your career break. The full policy can be found here.